A team of paramilitary commandos must battle flesh-eating undead, killer mutant dogs and a supercomputer's deadly defenses before an unleashed virus consumes humanity in this adaptation of the hit video game series! I really enjoyed the Resident Evil movie... After watching it I had the urge to play the video game some... so yes it did have the feel of the games to me. I thought Milla Jovovich did a great job as Alice. And I got a kick out of seeing how they did all the different creatures from the games. The Zombies was fine... the Zombie Dogs were very cool... and the Licker I thought came out awesome... but for some strange reason I didn't care much for how the licker mutated after making his first kill. I liked it's original look much better. If I am not mistaken.... this is the movie that made me realize how much I enjoy seeing horror and action mixed together. I think the 2 genres compliment each other very well. Then go for Silent Hill and .... I think that are all watchable video-game-movies. Will you watch Doom, Mortal Kombat and Wing Commander? I am sure I will be watching all the Resident Evil movies.... plus the Tomb Raider movies. I don't have Doom, Mortal Kombat or Wing Commander.... but I do have Mortal Kombat: Annihilation.. which I actually forgot I had until you mentioned Mortal Kombat... so I will probably watch that one too. I personally liked most of the Video-game-movies... but then I do tend to enjoy a good BAD movie also! In other words... when it comes to movies I am extremely easy to please and can easily leave my brain checked at the door when watching them. The first Mortal Kombat isn't as bad as it is always made and it has a nice soundtrack - but then on the other hand you don't like music. Is there a Uwe Boll boxset available? After narrowly escaping the horrors of the underground Hive facility, Alice (Milla Jovovich) is quickly thrust back into a war raging above ground between the living and the Undead. As the city is locked down under quarantine, Alice joins a small band of elite soldiers, led by Valentine (Sienna Guillory, 'Love, Actually') and Carlos (Oded Fehr, 'The Mummy Returns') enlisted to rescue the missing daughter of Dr. Ashford, the creator of the mutating T-virus. It's a heart-pounding race against time as the group faces off against hordes of blood-thirsty zombies, stealthy Lickers, mutant canines and the most sinister foe yet. I know of several people that was not pleased with this sequel. .. but I really did enjoy it. Not as much as the first one... but definitely enjoyed it. I thought they did a pretty cool job on Nemesis... and liked the feel of the movie moving on to the entire city. But when all was said and done.... the first one was better in my opinion. The main problem I think I had with this one is how they ended the movie. I do not like how they set up the next movie. Which leaves me with concerns for the new one I just got (and about to watch). If I would have remembered how this one ended I would not have been as excited about the new one... and probably would have held off on purchasing it till it went down in price some. Either way this movie has some great action-horror... and I still have hopes that the next one will at least have that. 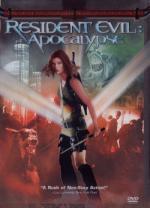 Milla Jovovich is back in the third chapter of the hugely successful Resident Evil franchise! This action-packed horror film is set in the Nevada desert and filled with intense special effects and more zombie terror! Las Vegas means fun in the sun. Well... atleast the sun is still there. Execpt for a few rusting landmarks, it looks pretty much like the rest of the desert - or the whole country, for that matter. The crowds are now flesh-eating zombies: the mass undead, the oozing, terrifying sludge of what remains. Here, the newly upgraded Alice, along with her crew (Oded Fehr, Mike Epps, Ali Larter, Ashanti) will make a final stand against evil - with one goal: to turn the undead... dead again. Now I finally got to see the latest of the Resident Evil movies. This is the first time I seen it since I normally don't do movie theaters. I would say that I did enjoy it... for what it was. Action-horror... but it is my least favorite of the trilogy. I think the story-line is getting a little to complicated... not that you don't understand where it is and where it is going. More that it just don't make sense... at least to me... where they are going with it. Lets just say... if I had control over it I wouldn't be going where they are with the storyline. Matter of fact I probably wouldn't have even left it open to go any further at the end of this one. But with that said... there is some fun to be had here... plenty of zombies and great action. In defiance of the Elder Lords, the evil Outworlders are back to wreak hell on Earth. Led by the mighty Shao Kahn, their gruesome goal is humanity's complete and utter extinction. Earth's last and only hope is the mighty martial arts warrior Liu Kang and his ferocious fighting friends. 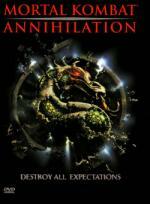 They're all that stand between life...and annihilation! OK... Let me start off by saying it has been a very long time since I seen this movie... or the first one for that matter... so I remember very little of the first movie going into this movie again. I didn't enjoy this movie as much as I remembered enjoying it in the past. Maybe it is because I wasn't able to watch the first one first. The last time I watched this I was able to get the first one at the video store I worked at.. at the time. The martial arts and special effects was cool... but how this one takes off right where the first one left off it was kinda hard to get in the mood for the story itself... as it felt like a cold, hard start of the story. Maybe would have been different if it hasn't been so many years since I saw the first one. Unfortunately real life got in the way today and I was not able to watch any movies for my marathon at all today. Hopefully I will do better next weekend. Well, you need to put that right!